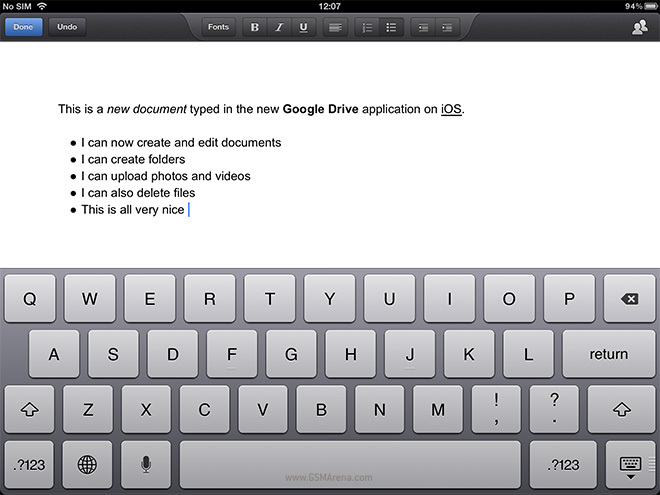 When Google released the Google Drive application on iOS, it was a mere shadow of the application available on Android. The most you could do in that application is view all your files and documents uploaded on Drive but the lack of editing made the application fairly useless. Well, that’s taken care of with the latest update, which brings with it several new features, the big one being able to edit all your documents. You can now tap on your documents and enter a view-only mode but with the tap of the Edit button you can start writing and also get basic formatting options. The documents are collaborated so any changes made elsewhere reflect immediately on your device. Unfortunately, editing is only available for documents and not for spreadsheets or presentations. You can also create documents now but there is no option to create spreadsheets or presentations. The Android version at least lets you create spreadsheets. Other changes in the new version include the ability to create folders and move items between them, ability to upload photos and videos and take pictures from the camera, ability to delete files, richer Google presentations with animations and speaker notes and support for over 30 languages. The Android version also got an update and brings with it ability to create folder and move to folder, option to auto-sync pinned content while on 3G, richer Google Presentations viewing experience, basic table support in Documents Editor, create, reply and resolve comments in Documents Editor, view and change fonts in Documents Editor, pinch to zoom in Documents Editor, print files using Google Cloud Print and option to resume interrupted uploads. The updates are now available on the App Store and the Play Store respectively.